The former owner of a local horse rescue was arrested this week on charges of animal cruelty and first degree arson after she allegedly set her foreclosed home on fire, killing 17 of her pets. Diane Davis, 57, was booked into the Nye County Detention Center Wednesday on charges of first degree arson; 17 counts of torturing, overdriving or injuring an animal; discharging a firearm within a structure and resisting a public officer after police were called to the Dream Chaser Ranch Horse Rescue at 3610 N. Murphy Street last Friday evening. According to the Nye County Sheriff’s Office, deputies responded to the property for a report of a female wanting to commit suicide around 9:17 p.m. As officers began making their way to the address, they were further informed the woman, later identified as Davis, had barricaded herself inside the home with a firearm and several of her dogs. When police arrived on scene, deputies could see Davis through a window in the home with a gun in her hand. Deputies began trying to talk the female into coming out of the residence, but Davis reportedly refused. As officers continued trying to convince Davis to exit the home, Davis reportedly fired a single gunshot inside the residence. Soon after police noticed what appeared to be a fire in a back room of the residence. The flames produced heavy smoke conditions, which eventually forced Davis to leave the residence with her gun in hand. Deputies immediately gave Davis commands to put the gun down, but Davis allegedly refused and began trying to make her way back inside the burning structure. As she allegedly continued to ignore police commands, an officer on scene Tazered Davis, causing her to drop her firearm, and allowing police to restrain her. 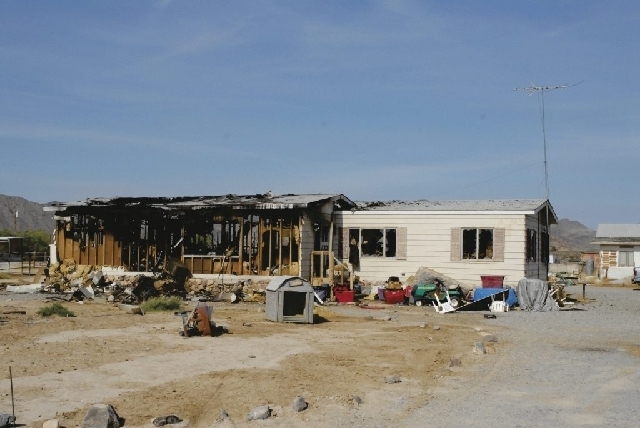 Pahrump Valley Fire Rescue Services were also called to the scene to deal with the fire. When firefighters arrived, Fire Chief Scott Lewis said they found heavy fire conditions inside the home. Crews had trouble accessing the fire, however, he said, due to an overabundance of personal items inside the home, some of which were being used to barricade the doors shut. Once the fire was extinguished, an investigation revealed Davis had intentionally set the fire that claimed the lives of 17 of her dogs inside the home. After she was treated for smoke inhalation at the scene, Davis was placed on a Legal 2000 hold and transported to the hospital for further care. Once she had been cleared from the hold, police arrested Davis and booked her into the local jail in lieu of $35,000 bail. She was soon after released on her own recognizance by a local Justice of the Peace. The home Davis allegedly set on fire was sold last month at public auction for unpaid debt on the ranch. Several horses and other animals were removed from the property by Nye County Animal Control following the fire. Though the fire was extinguished Friday night, firefighters were requested to respond to the property a second time the following morning as some of the numerous personal items in the home had re-ignited sparking a second fire. As of Thursday morning Davis remained out of custody. She is scheduled to be formally arraigned in the case on July 24 in Pahrump Justice Court.